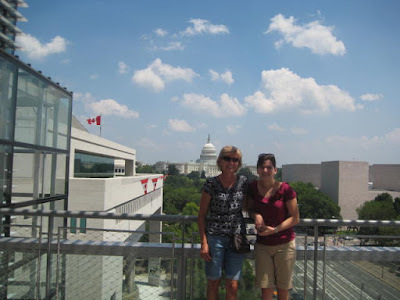 I went to DC last weekend to visit my Mom who was there for a conference. 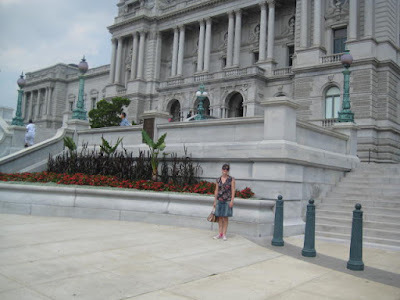 We went to lots of museums and geeky stuff that we totally enjoyed and both Rob and Chip were happy we did together so we never have to make them come along. We went to the Library of Congress. I am now thinking up relevant research so that I can get a library card and access the reading rooms. Getting a PhD allows me to do this and I need to exploit it while I can. We went to the Newseum which Mom thought was great as a history teacher and I spent too much time reading. This is not the place to go if you don’t like to read. But the view from the promenade was pretty cool. The Mountain Eagle is the newspaper from Letcher County Kentucky where my Grandma Frazier grew up. She still subscribes and gets a stack of papers every week / month – I don’t know how often they come. But seriously, who knew that this small town paper (that publishes notes from readers to other readers as a mini-classified section) would be featured at a major museum. We walked a lot, talked a lot, and ate a lot. Now if my library book wouldn’t have been lost in the hotel (I’m pretty sure it got tangled in the bedding when the sheets were changed) the weekend would have been pretty close to perfect. We were the Kickball Champs!! !